The apartment was nice and clean. WIFI & air-conditioning worked fine. George was gracious host...met us at the ferry (and also dropped us off when we left) and made sure we had everything we needed to enjoy our stay. He gave us a great overview of the island and beaches, which was so helpful. The location near the harbor was nice with restaurants, shops and cafes, great for walking in the evening. The place is located at a very good position, in a walking distance from the center of the village, the port, and the 2 beaches (Avlomonas, Livadakia). It's very clean, neat, modern, new. I liked the wooden roof of the room. The kitchen is enough equipped. The basics for breakfast are provided, honey, jam, butter, coffee. 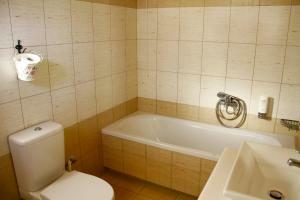 Spacious room, big bathroom with bathtub! WiFi is good. It's so quiet, you hear nothing from outside. The host was very helpful and answered all the questions, gave us information about the area, good communication before and after arriving. Transfer was also provided at arrival/departure. Strongly recommended! George, the host meets you at the ferry. Hotel in quiet location about 200m to port with shops and restaurants. 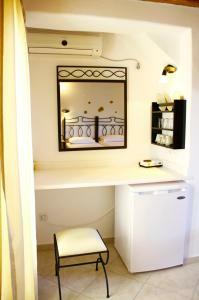 Very nice room with all the usual amenities plus a kitchenette. Our room had two balconies. 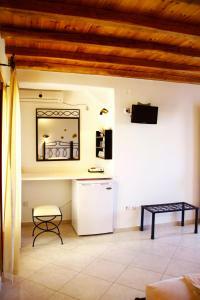 Our stay in Alisachni was one of the most rewarding experience - relaxing, comfortable, with all the necesary amenities. The host Giorgos is part of this wonderful experience with his useful advices, allways ready to help, taking us with his car from and to the ferry. The cleanness of the rooms was to be remarked (especiallly for a sandy location), with daily service and exchange of towels and bed sheet. With a pleasant and silent location of the villa and the view from our terrace with picturesque Chora village on the mountain and the charming Serifos island, a morning coffee in this location is what we hope we will find when we get back next years. 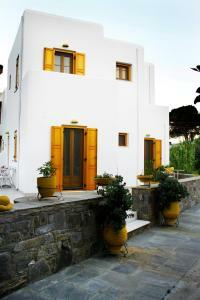 Excellent facilities in Cycladic style, very clean, quiet location in a third line of houses from the shore. Comfortable beds and a little private balcony for breakfast or wine in the evening. Super friendly host Giorgios will answer your every question. You really don't need more for a break in Serifos, so no need to look further. Everything room spotless mind spacious fridge kettle everything was reached in fridge is mama honey btle water each day. Bathroom was like one at home bath good shower etc couldn't fault these studios. Staff were so helpful pick you up from port and we're so friendly couldn't help you enough George was a lovely friend fly helpful person would definitely stay again probably for longer. Near to beach restaurants and local bus to chora was every hour because September lovely walk back down all paths marked. Plenty lovely walks and two bakeries and 3 supermarkets so ideal. The apartment was in a quiet location close to the port and restaurants. Wonderful, friendly host who was always available and helpful. Apartment clean & well presented. It was also handy to have access to parking close to the accommodation. The fact that parking place was provided by the hotel is very important ! Moreover both the room & the bathroom were very spacious and the location is convenient - everything within walking distance ! Very clear and comfortable room! The host was very friendly and hospitable! Great location! Lock in a great price for Alisachni – rated 9.6 by recent guests! Offering a sun terrace and views of the mountain, Alisachni is located in Serifos, 1.2 mi from Psili Ammos Beach. Serifos Old Mines are 5 mi from the property. Free WiFi is featured throughout the property. 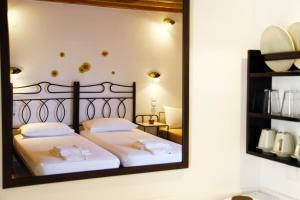 The accommodations is air conditioned and is equipped with a flat-screen TV. Some units include a balcony and/or patio with garden views. There is a private bathroom with free toiletries and a hairdryer in each unit. Towels and bed linen are available. When would you like to stay at Alisachni? 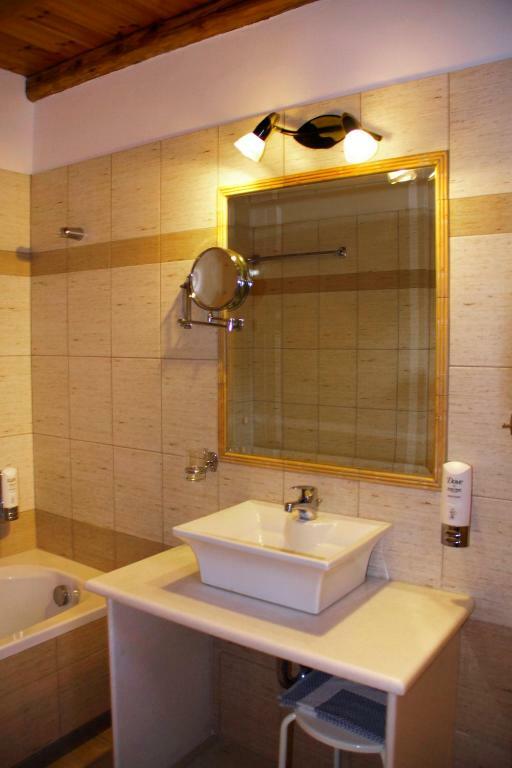 This double room features a patio, tile/marble floor and balcony. This twin room features a private entrance, patio and balcony. This double room features a patio, electric kettle and balcony. 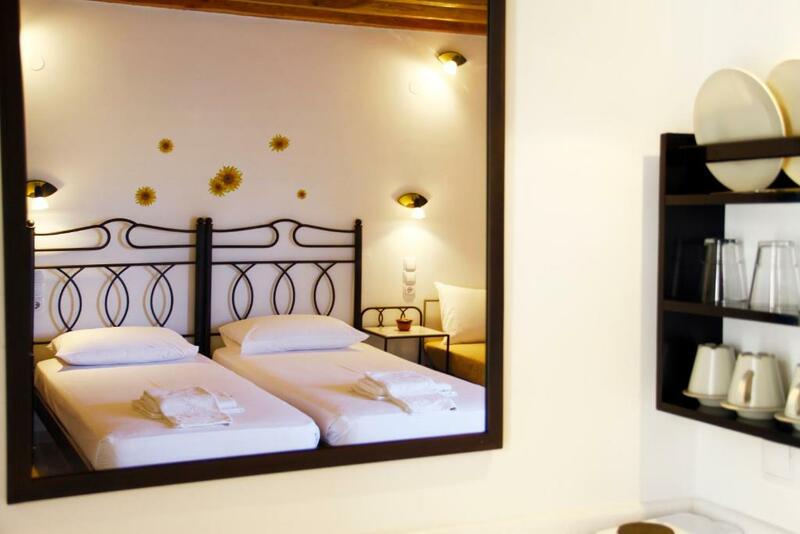 This triple room has a soundproofing, air conditioning and garden view. 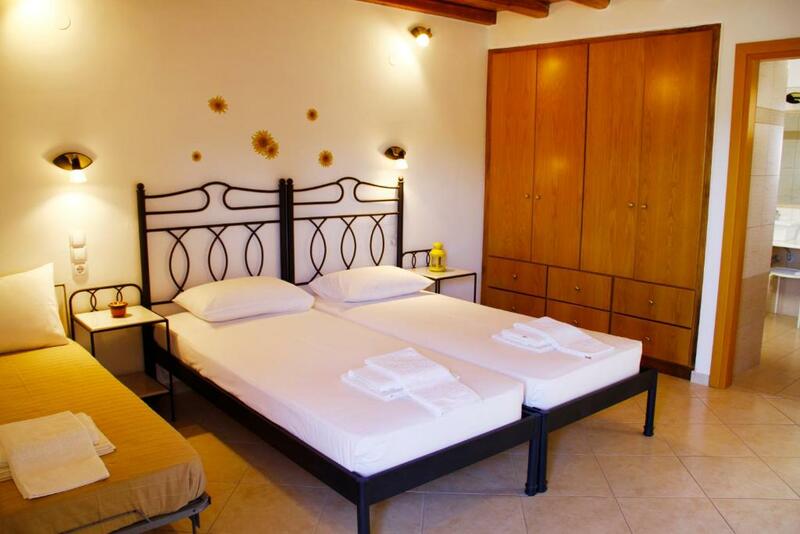 "Alisachni Rooms" situated few meters from Avlomonas beach, without a doubt the most pure blue sea of the island. The waves' sound, the immerse horizon blue, and the magical beauty of Serifos island, create a magnificsent environment of relax and calm. At "Alisachni" will find rooms and appartments with frige, A/C, TV and balcony, but most of all pure clean sea at a little distance from your room. Finally we guarantee excellent service, cleanness, and good prices. For unforgetable holidays Serifos is waiting you. House Rules Alisachni takes special requests – add in the next step! Alisachni accepts these cards and reserves the right to temporarily hold an amount prior to arrival. Please inform Alisachni of your expected arrival time in advance. You can use the Special Requests box when booking, or contact the property directly using the contact details in your confirmation. Hand held shower with no curtain which in not unusual in Greece. We like all. Giorgos est un hôte excellent. The only thing was the AC had strong screen lighting and during the night was a bit annoying. A shower curtain and an armchair would have been useful. Great location-- very close to everything in Livadi, but in a peaceful-- almost rural--neighbourhood. Comfortable and spacious room. Wonderful terrace (in room 6) with views of Hora. Spotlessly clean, restocked coffee and drinking water every day. And Giorgio was incredibly helpful and friendly. Hands down the best place to stay in Serifos, at any price level. 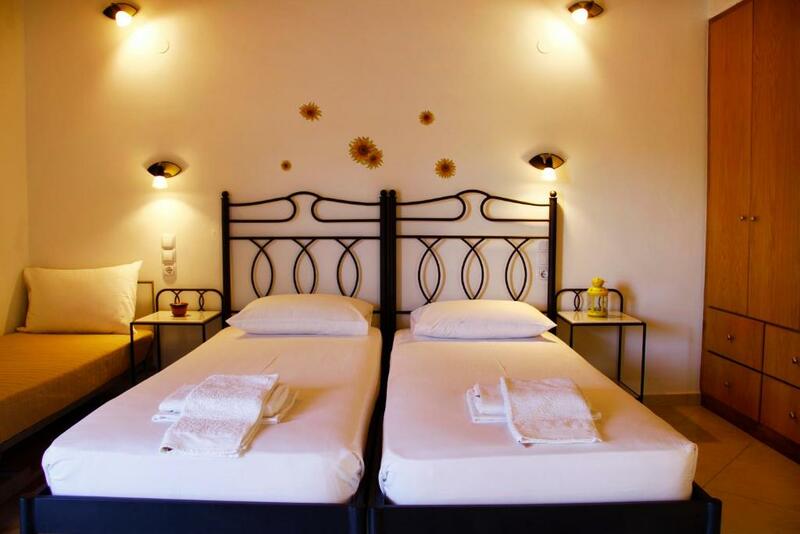 Alisachni is located in a very convenient spot of the port, parking included. 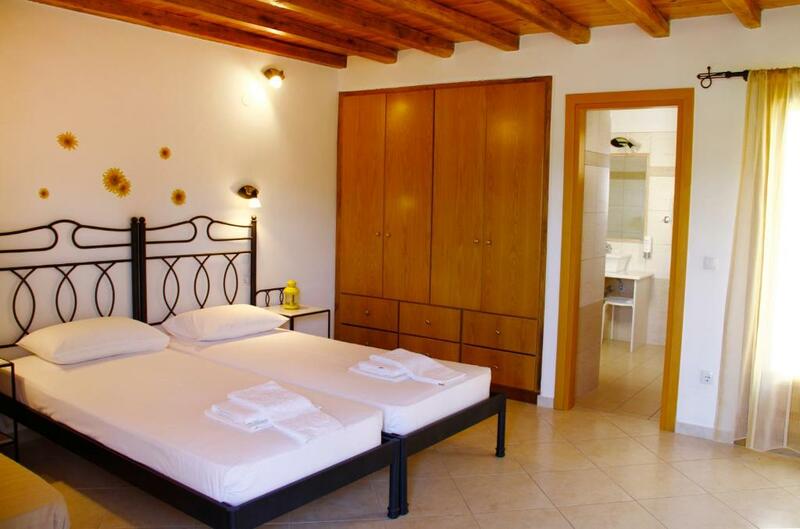 Rooms are clean and Giorgos will give you the best recommendations for beaches to visit and food to eat. Giorgos was so obliging picking us up from the ferry and making recommendations about things to see and do. He is justifiably proud of his beautiful island. Very good size bathroom but shower/tub did not have shower curtain. No problem as this is very normal in Greece. Everything was excellent! We had front upstairs apartment (number4) with a nice view of the Chora up on the hill from the apt and the balcony! View was beautiful at night! Great apt with good size bathroom with tub and plenty of warm water. Giorgos was a great host and picked us up from the ferry, nice guy to talk with and gave us all the information and more about the island. Kitchen was clean with large fridge. Wifi was excellent. Close to town restaurants but far enough to be quiet in the evening. Property is clean and very well maintained! Would easily return to this great place! Airco and tv everything we needed was in the apt! When we wanted to stay longer and this apt was already booked Giorgos even helped us with another great apt in the Chora!!! Thank you Giorgos! Picked up from Ferry on arrival by Georgios who took us back to the apartment. Gave us several information pamphlets and maps along with cold drinks. Recommended restaurants etc and we had 6 lovely days there, all along Georgios very helpful. Room was beautiful,very clean,spacious and very well kept. It was near to everything and even we did not have a sea view,we did have a view to chora. Owner was very kind,pick us from the port and tell us things we should do in the island.